Well Life Family Medicine understands the significance of a healthy, well-balanced diet. We are firm believers in the healing power of good food. We provide effective nutritional counseling and therapy services to patients. Our nutritional counseling and therapy sessions entail nutritional advice and guidance from a certified expert and personalized dietary and lifestyle plans. From weight control to disease prevention and management, our carefully crafted nutrition plans are designed to resolve several health issues. If you are experiencing any disease or disorder, our staff can help you to change your diet to improve or manage your symptoms. They will work with you to identify your health goals and needs, and develop a practical plan that fits your specific requirements. For the body’s growth and development, it needs essential minerals and vitamins. Essential nutrients perform unique physiological functions. Lack of these nutrients can have an adverse impact on the immune system. Therefore, it is crucial that you consume sufficient amounts of essential minerals and vitamins to achieve a healthy life. 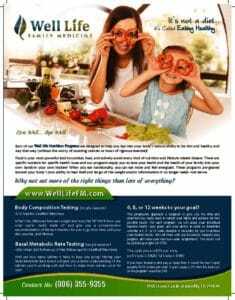 Well Life Family Medicine provides Genova’s Nutraval and SpectraCell’s Micronutrient Test. The Spectra Cell test assesses an individual’s intracellular functioning. Your white blood cells contain 35 vital minerals, vitamins, antioxidants and other micronutrients. The overall result of the analysis can indicate something valuable about your nutritional status, over a long-timeperiod. It also provides significant measurements that can be used to develop your nutritional plan catering to your individual needs. With the unlimited amount of information out there, patients are often inundated with diet plans. Choosing the right dietary plan can be challenging. Not to mention, we all have different dietary needs and goals. Depending on your unique body and biochemistry, you will need to adopt eating habits that can optimize your health. If you want to find out your specific requirements, Well Life Family Medicine performs comprehensive testing. Along with identifying what you need, our experts develop proper dietary plans, including recipes for patients. There is no denying that supplements can’t replace a healthy diet. That said, they are necessary to promote your health and well being. They also play a critical role in effective management of certain medical conditions. It is extremely important to take health supplements after consulting with a certified medical practitioner. Otherwise, you may experience serious side effects. At Well Life Family Medicine, we have extensive experience and expertise in recommending the right supplements to patients, depending on their health needs and goals. Do you want to know what vitamins and minerals you need? Contact us now to find out.